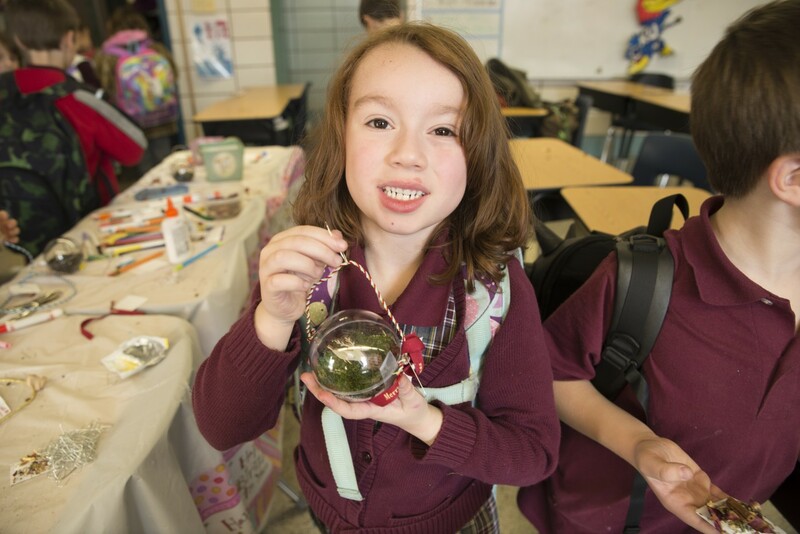 For one December session of our Plant Explorers after school program at Chicago International Charter School—Irving Park, the students made living ornaments for the holidays. This tiny terrarium project can have a calming influence on a potentially hectic holiday, because green and growing plants make us feel more relaxed. It requires you to find some live moss, but it makes an extra special decoration for kids—and adults—who love plants. 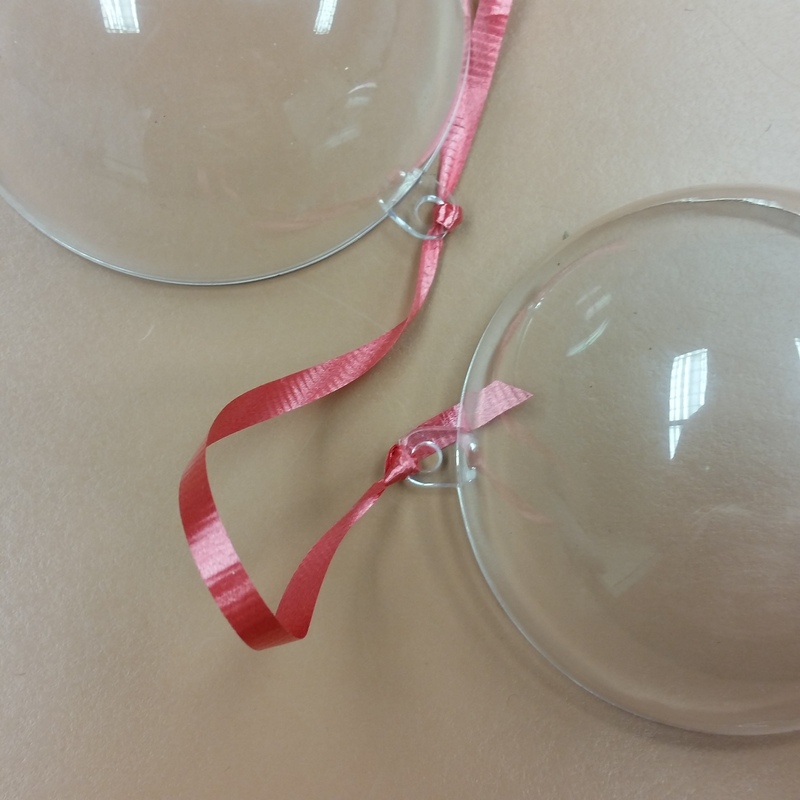 Separate the halves of the DIY ornament. If your ornament is like mine, it has little “loops” for attaching a hook at the top. Start by tying a 12-inch piece of ribbon to each half of the ornament through the loops. In one half of the ornament, add about a teaspoon of activated charcoal. 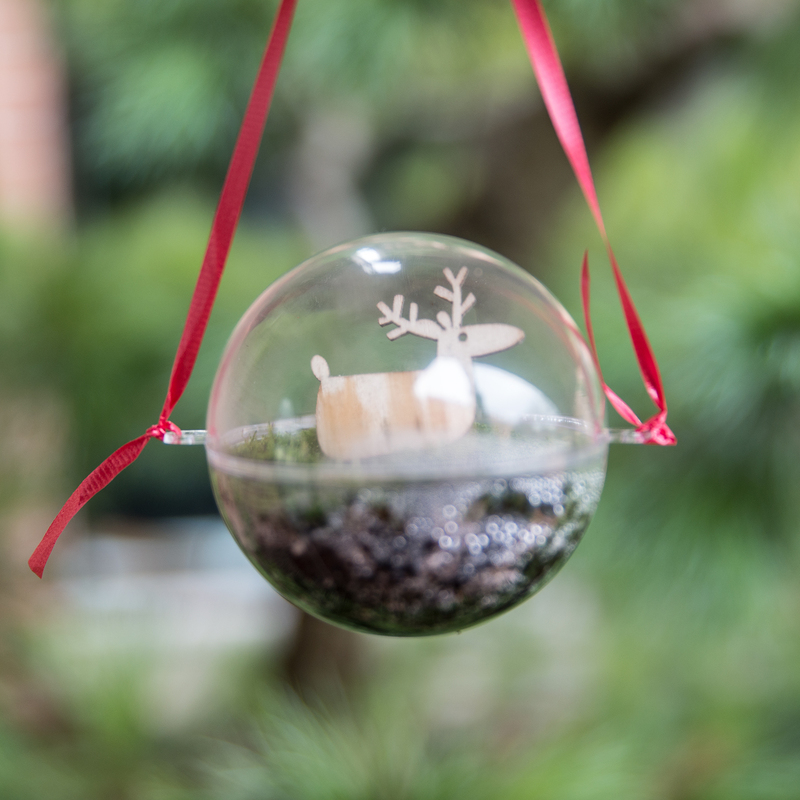 Fill the rest of that ornament half with very wet soil to about a half inch below the top. Use whatever decorative ribbon you like, but make sure it’s narrow enough to fit through the ornament loops and that it’s knotted securely. 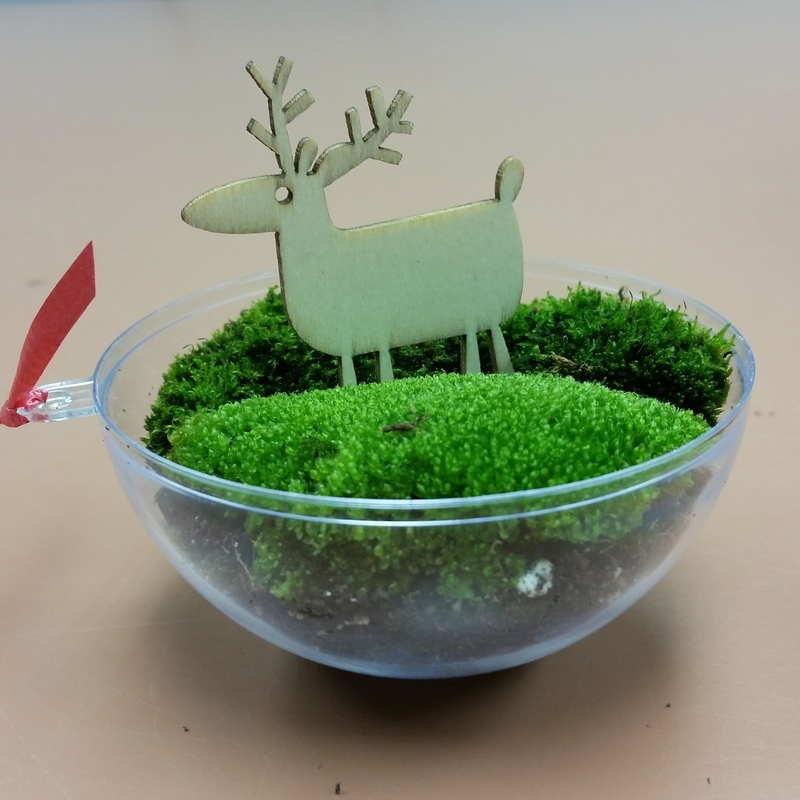 The moss ornament is almost complete with charcoal, soil, moss, and reindeer! Place the moss on top and gently press it into the soil. If you like, add a miniature object to add a little whimsy. Craft stores have lots of miniature objects that would look good in this ornament. We chose these woodcut reindeer to look like the animals were walking through a forest. And there were enough in the pack for all 15 students to get one. Use whatever you like! If you have a spray bottle with water handy, it helps to give the moss leaves a gentle misting before closing the ornament. Seal the moss in a closed terrarium ornament. The moss can live inside this globe indefinitely. Place the other half of the ornament on top, but instead of lining up the two loops, put them at opposite ends so that you can hang the ornament ball sideways and not disturb the arrangement. You can tape the two halves together with clear tape if you are concerned about them coming apart. I suggest only taping the sides near the loops rather than wrapping it all the way around so the tape is less obvious and you can open the ornament later if you want to. The moss just needs light from your home to survive through the holidays. Moisture will evaporate from the soil and will collect on the insides of the ornament. It will roll back down to keep the moss watered indefinitely. Now you’re wondering if (and how) the moss will survive. I have your answers: read on. 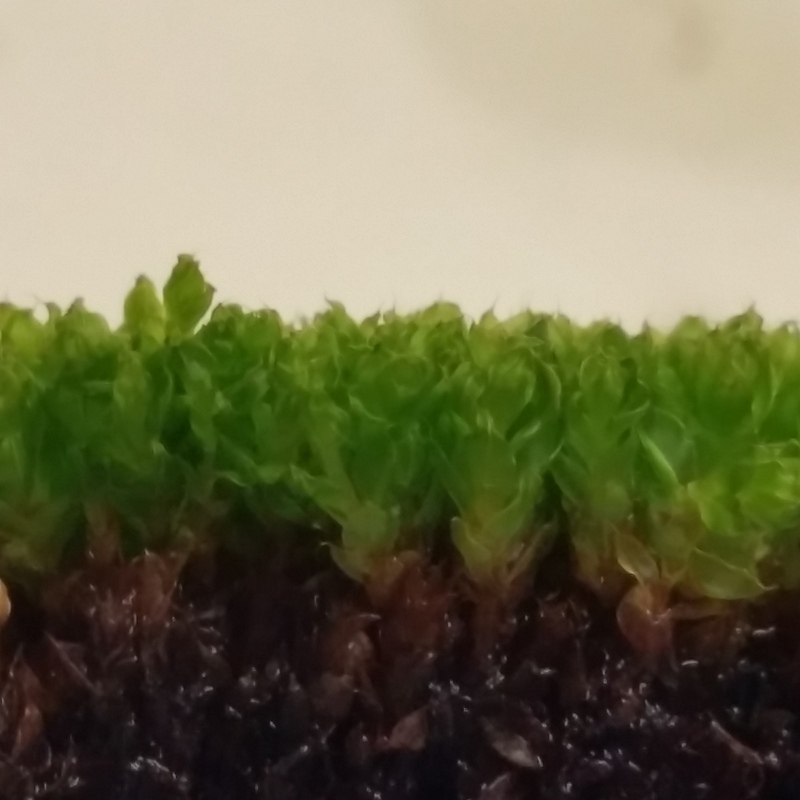 Mosses are simple plants that scientists classify as bryophytes. What you see as a clump of velvety green carpet is actually hundreds of tiny individual moss plants clumped together. Botanists refer to these as gametophytes. 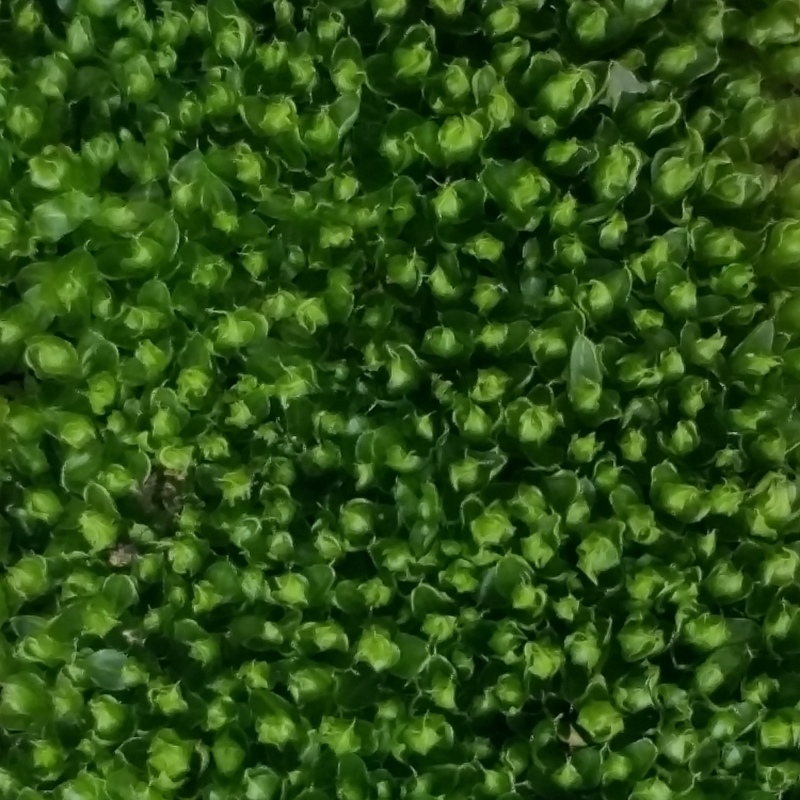 A close-up of moss seen from above shows the tops of hundreds of individual plants clumped together. Seen from the side, the moss looks like a tiny, dense forest. Mosses do not have true roots. They have rhizomes that anchor the plant to the soil and send up buds for new individual moss plants, but the rhizomes do not transport water like true roots. 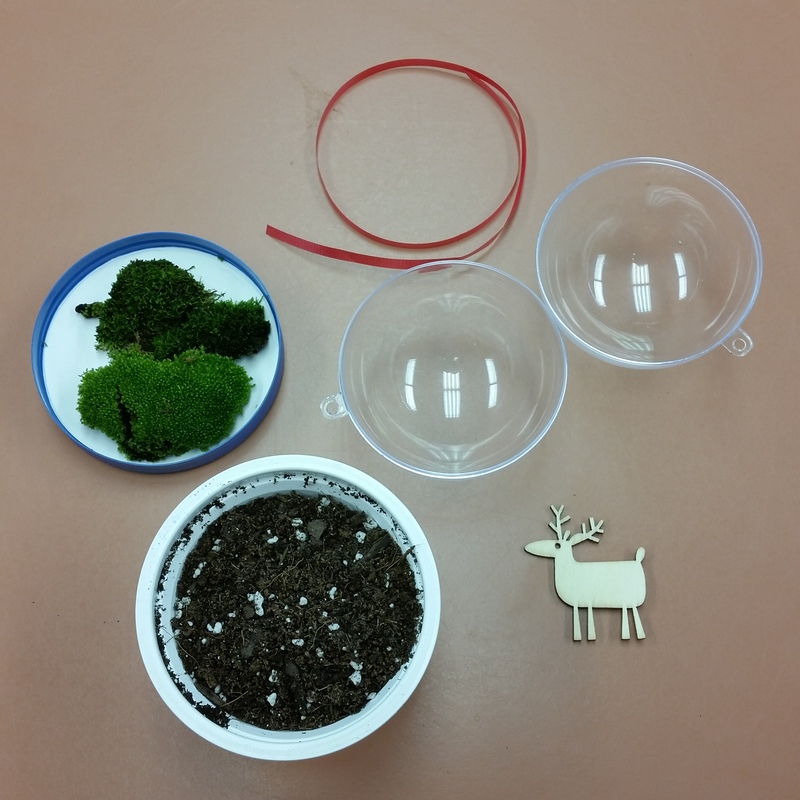 Mosses absorb water, nutrients, and carbon dioxide through their leaves. The rhizomes are fine and grow at the surface of wherever they are planted, so they do not require deep soil. As a result, moss can grow in any porous surface, like tree bark or a stone (but maybe not on a rolling stone!). 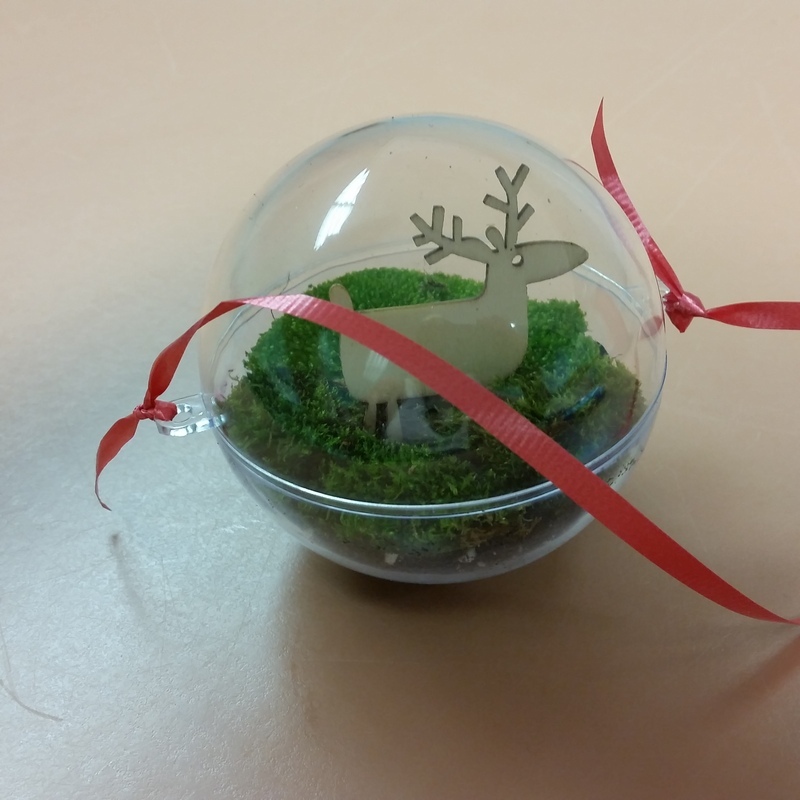 So moss can thrive in the small amount of soil in your ornament. The moisture sealed inside the globe will keep the air humid and supply the leaves with water. Mosses also do not flower or make seeds. They produce tiny spores that are difficult to see without magnification. The spores are carried by wind until they fall, and there they wait for the right conditions to grow into new moss plants. 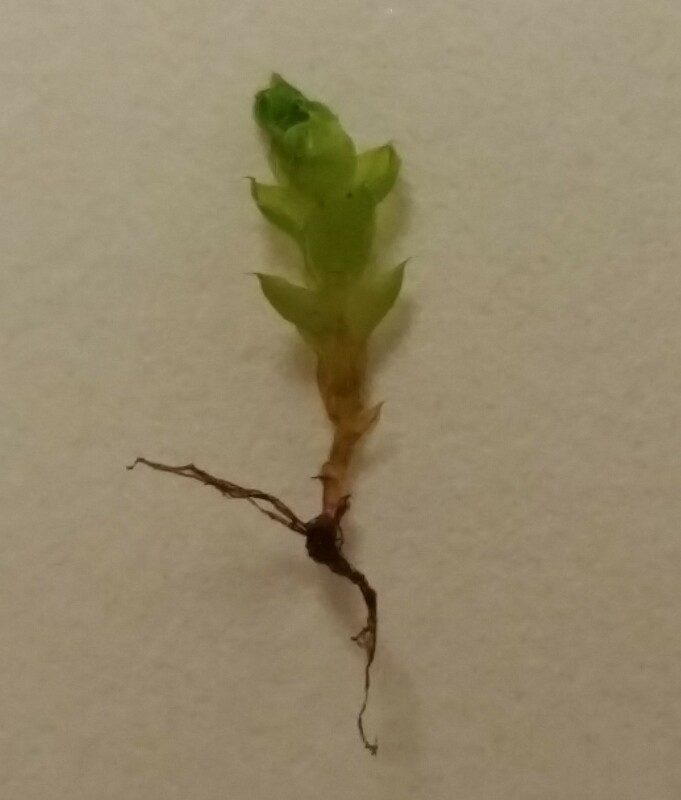 A single moss gametophyte grows from a root-like rhizome. 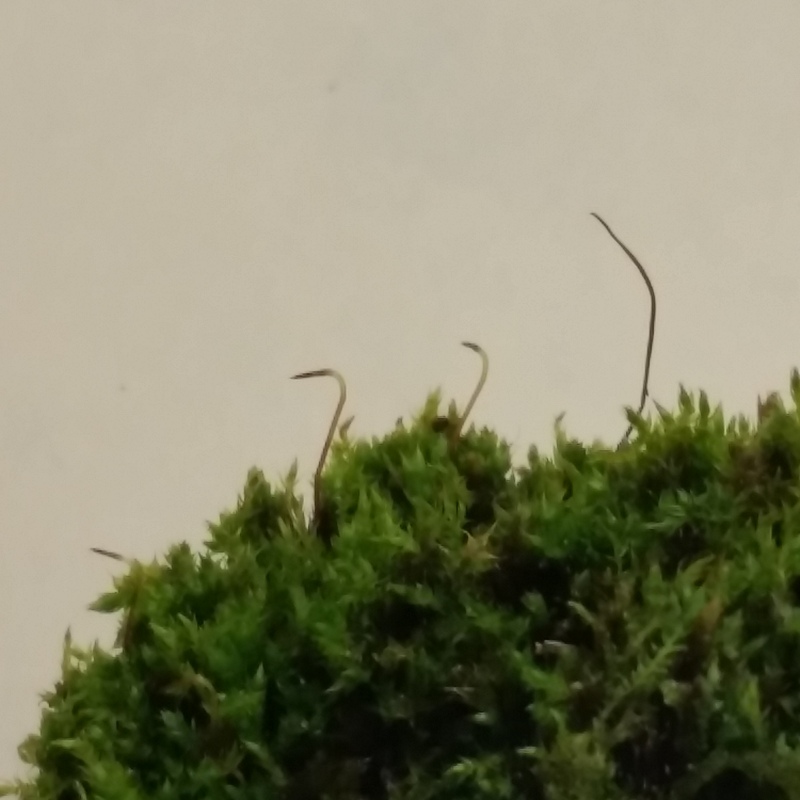 The tips of the taller slender structures are sporophytes that will release spores and continue the life cycle of the moss. If your moss dries up or becomes dormant, do not despair! You can bring it back to life by soaking the dry clump in water and keeping it moist. This will reinvigorate the dormant moss and activate spores that are lying hidden in the dry moss, enabling them to grow into new moss. Find more fun projects for the holidays! Make Spicy Greeting Cards and Rock Candy, or a Grapefruit Bird Feeder. ‘Tis the season for a little Christmas tree taxonomy!